These are all of the Dear Jane blocks I have made since January of this year. I’m still not that speedy. But I have been having a Dear Jane Weekend. I’ve made 5 blocks so far and have 3 more prepped. It’s been good to spend some time with Jane. I’ve noticed a few things: For one thing it’s becoming more comfortable to sit down and hand sew. And I’ve changed the way I’m labeling each block. Now I’m writing the block number on freezer paper and ironing it on the back. I think I ran across some blocks like this on Flickr and the “aha” moment took over. What a good idea! A marathon weekend of Jane blocks has also given me an opportunity to try out these glue sticks by Lapel Stick. 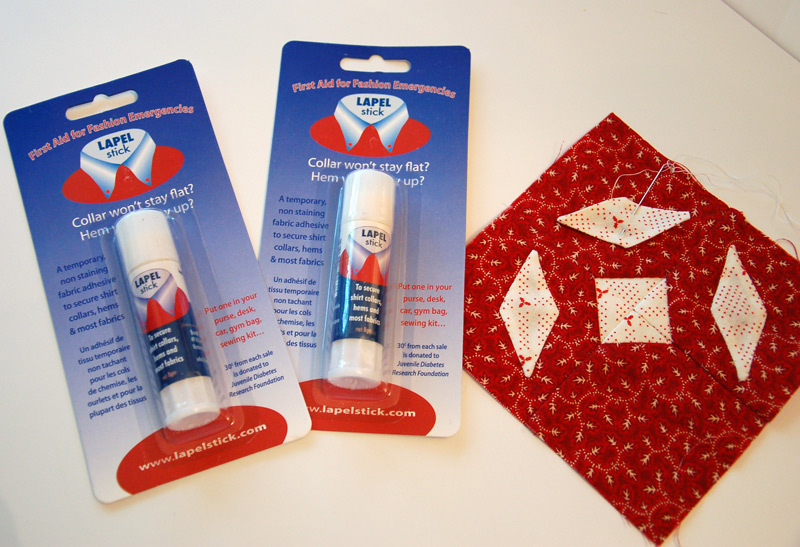 It’s a temporary glue and although it is meant for fashion emergencies but it works great for applique as well. I’ve been fighting with pins sticking out everywhere when sewing down an applique piece. So this was the perfect opportunity to smear some glue on the back and try it out. I just held the piece down on the background for a minute or so and then stitched around the shape. I love that I don’t have any more pin points sticking out and poking me! The manufacturer gave me a couple of glue sticks to give away so that you could try it too. Leave a comment and I’ll draw a couple of names later on this week. So far I have a total of 41 blocks consisting of 543 pieces. I still haven’t reached my first year goal, but it doesn’t really bother me. It may take me a lifetime to finish but that’s okay. Love your reddish DJ blocks!!! Now you are really inspiring me to get back to my Jane blocks. I think the glue sounds like a great idea. Your block look great so far!! I just bought the Dear Jane book and software and have started collecting Kaffe Fassett fabric. I’m a little daunted, but bound and determined to make this quilt. The glue sticks looks like a great tool. Thanks for the giveaway and good luck on your quilt. The red and white is great – did you see the 650+ red/white quilt exhibit in NYC recently? Oh – and your labels are a great idea! What a great idea, I’d like to try that lapel stick. Unfortunately my baby jane hasn’t gotten a lot of attention lately. But it’s a journey right?! ooh, the glue sticks sound awesome! your dear jane blocks are lovely! i sorted through mine this weekend as well, having not touched them in months…so close to finishing though! would love to try the glue. I love your blocks. I love this quilt, but don’t think I could get it finished! I have been wanting to try these glue sticks, thanks for the chance to win! Your blocks are beautiful! Some day I may try one. Gorgeous!!! I’m loving your palette of reds. This quilt is going to be amazing. And no stressin’ allowed– this quilt is definitely all about the journey, not the speed at which you make it (says she who has been working on hers since 2004 :P). This makes me want to dig out my Jane quilt. What a great way to label them! And that glue stick seems great too! The blocks look great! And the labels and glue sticks are genius. Again, what fun you’re having! Anita! These are sooooo beautiful! Congratulations! I haven’t even started mine, and wow, after seeing yours I promise I will make one TOMORROW! such an inspiration… and I love your attitude– Thanks! how fun! im glad you had so much progress on your dear janes this weekend, because i am living vicariously thru you!! the glue sticks seem like a great idea. would love to win one as im working on an applique project too. my beef isnt so much the pins poking me (which i do hate) but the shifting of the fabrics in the beginning. 543 pieces…..WOW!!!! These are great! More gorgeous Dear Jane blocks!!! Since I do a lot of applique I would love the chance to win one of those glue sticks to try out. One question–do you use a running stitch or a back stitch when sewing those blocks together? Several good ideas here. Thanks for sharing. I’m loving your red and white palette too. Beautiful DJ blocks! Love them in red! I too would like to know what type of stitch you use to put your blocks together. I enjoy your Dear Jane blocks. I too would like to try the glue sticks also. I am just a beginner at applique and really like it. Love these red & whites. Did you see the red & white quilt show in the armory in NY I think – just a month or so ago? Stunning! I should go find the glue stick! All the pin pricks always make me a little hesitant to try my hand at hand sewing blocks…your Dear Jane is so beautiful! I wish I had the perseverance to make one! I don’t need the glue stick, but I do need to comment on your Dear Jane blocks. They are gorgeous!!! I love the colors and fabrics you are using. It is going to be a beautiful quilt. I love your blocks! Your fabric choices are really turning this into a spectacular piece of art. Your blocks are beautiful. I can’t wait to see the finished product. And those glue sticks are a great idea! Blessings! Your red and white blocks are so beautiful! They are truly a labor of love! It has been a slow but consistent waywalk. This quilt is really chalenging! You are currently reading A Dear Jane Weekend at Bloomin' Workshop.